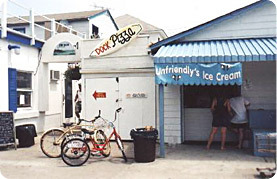 There's Something for Everyone to Smile about on Fire Island! Spending a summer or a few weeks of precious vacation time on Fire Island's sun-drenched beaches either in Fair Harbor, Dunewood or Lonelyville offers something for everyone. We like to say "We have one of everything!" From pizza to pinot noir ... from pails and shovels to paper plates, Fair Harbor has all the amenities you need, and it's only a short walk from Dunewood and Lonelyville. All shops deliver for a fee right to your door. Bars and discos open until 4:00 a.m.
A 10-minute bike ride or water taxi to neighboring Kismet for lunch or dinner is always a special treat. You can dance until the wee hours of the morning on Friday or Saturday nights to some of the best local bands; and top it all off with Sunday dinner, live music and dancing at Surf's Out restaurant with its outdoor patio and beach. 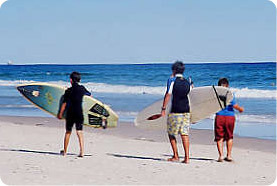 Fire Island offers children a sense of independence that they cannot get anywhere else. The children's bay beach area in Fair Harbor offers a playground for the younger set. A lifeguard on this stretch of the Great South Bay Beach is on duty at all times. There are roped off areas and a swim platform. Swimming lessons are available for ages 2 and up. The playground with slides, swings and monkey-bars is adjacent to the bay beach area. Benches are provided to sit and relax. On rainy days there are activities for the children in the Fair Harbor Fire House. Wednesday night is movie night with cartoons, a PG-rated film and - it wouldn't be movie night without popcorn! Fair Harbor's beaches are the largest and best on Fire Island. You may bring your picnic lunch to the ocean beach or a cooler of iced drinks for the afternoon. Show off your athletic abilities with a rousing game of volleyball or paddleball ... or simply gaze out at the ocean and indulge your lazy side. There is a windsurfing and a sailing club down at the bay where, for a nominal fee, you can store your boards, boats and equipment. There are public docking facilities, but moorings can be dropped in safe, protected areas. If catching a delicious fresh fish for dinner is your wish, you can try your hand at casting off the bayfront docks for weakfish, blues or striped bass. The Great South Bay is known for its fine fishing. Feel like some baked clams tonight? Wade out into the shallows of the Great South Bay and put those toes to work! They're out there! Although there are no public docking facilities, going down to the Fair Harbor dock at sunset is almost as famous in Fair Harbor, Fire Island as in Key West. Couples, families, and singles gather there with a drink in hand to meet and talk, and of course, people-watch. After that, it's back to the deck and time to begin the evening's BBQ. For a relaxed, easy, and fun time, it's Fair Harbor, Dunewood, and Lonelyville - the part of Fire Island to be in!